The sixth anime movie adaptation of the popular franchise to premiere on April 18, dubbed in English for the first time. Philippine-based licensor Telesuccess Productions has released on Friday the full promotional video for the anime movie Mazinger Z: Infinity’s upcoming screening in the Philippines. As previously reported last March, the anime movie is set to premiere in local cinemas on Wednesday, April 18. Anime Pilipinas has learned from informed sources that the anime movie is set to be screened dubbed in English on 5.1 surround sound, and the rationale behind the dubbing was for the benefit of moviegoers in the provinces and other regions. This will be the first time in the world the anime movie will be heard in English dubbing. Sources also say that some of the dubbers who worked in the movie were previously a part of the Voltes V compilation movie “The Liberation”, as well as dubbers from the Filipino-dubbed version of Shin Mazinger Edition Z.
Voltes V: the Liberation movie was screened in local cinemas in the late 90’s. Shin Mazinger Edition Z was aired on terrestrial broadcaster GMA-7 and defunct anime channel HEROtv in 2010, and defunct entertainment channel TeleAsia Filipino in 2014. A source familiar to the matter has told Anime Pilipinas that the English-dubbed version of the movie would be the official dub in Asia, and there are plans to release the dubbed version simultaneously in Singapore. Singapore-based anime licensor ODEX has screened the movie in Singapore last month, and they have yet to confirm if they plan to release the dubbed version in cinemas. 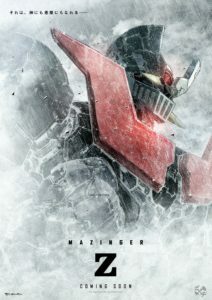 The licensor also announced on their Mazinger Z: Infinity Facebook page on Sunday that they will be giving away movie posters for “the first 10 to reserve tickets”, but they did not specify details including a possible special screening date and location, as well as the reservation. More details may possibly be announced in the coming days. Mazinger Z: Infinity is the sixth anime film adaptation of the popular mecha/robot franchise, which was based on the manga series written and illustrated by Go Nagai. The manga ran from 1972-1974, which has a total of five (5) volumes. The manga eventually have several anime adaptations, including for television, home video and theatrical releases, as well as toys, video games and other merchandises. The movie will be directed by Junichi Shimizu, who previously worked in One Piecetelevision and movie adaptations, while screenplay was handled by Takahiro Ozawa. Hiroya Iijima, who worked on shows like Afro Samurai and Seikon no Qwaser, handled character designs, which was produced by Toei Animation. Japanese voice cast are lead by Showtaro Morikubo (“Yusuke Makishima”, Yowamushi Pedal) as “Koji Kabuto”, Ai Kayano (“Diamond”, Land of the Lustrous) as “Sayaka Yumi”, Sumire Uesaka (“Fubuki”, Kantai Collection) as “Lisa”, and Unsho Ishizuka (“Bunta Fujiwara”, Initial D) as “Dr. Hell”. Last month, theater chain SM Cinema has uploaded a teaser of the movie on their Facebook page, stating that the movie is “coming soon”. UPDATE (01:20pm PHT): Additional information on the dubbing cast has been added. UPDATE 2 (10:55pm PHT): Additional information regarding the dubbing has been added.